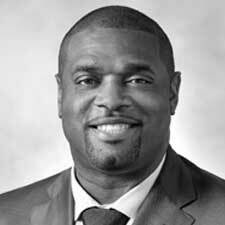 Henri Crockett is the co-founder and president of the Crockett Foundation, a South Florida-based non-profit organization that serves youth through educational programs with the mission to help build character, develop leaders and improve the community, one child at a time. A native of Pompano Beach, Florida, Crockett earned an athletic scholarship to Florida State University where he joined his older brother Zack as a member of the Seminoles, (the 1993 National Champions and the Atlantic Coast Conference Championship team from 1993 to 1997). In 1997, Crockett was selected in the 4th round of the National Football League (NFL) draft. He played for seven years, five seasons with the Atlanta Falcons and two seasons with the Minnesota Vikings. He was a starting player with the Atlanta Falcons in Super Bowl XXXIII in 1999. Shortly after being drafted by the Atlanta Falcons, Crockett founded Team 94, a non-profit organization that assisted at-risk youth with after-school tutoring and mentoring in the metropolitan Atlanta area. Through his individual effort with Team 94, Mr. Crockett was able to help several young adults in the Atlanta area achieve their dream of attending college, which seemed out of reach for them at the time. Crockett was so inspired by the progress and achievements of the youth enrolled in Team 94 that he sought to expand his philanthropic reach. After relocating to Minnesota when he was traded to the Vikings, Crockett co-founded the Crockett Foundation with his brother Zack. The brothers returned to their hometown of Pompano Beach, Florida during the 2002 off-season and began hosting the annual Crockett Foundation Weekend, which included a black-tie gala, a golf tournament, and a football camp for youth to raise money for educational tutoring and mentoring programs in the City of Pompano Beach. Since its inception, the Crockett Foundation has been strongly committed to its mission of helping build character, develop leaders and improve the community, one child at a time. In 2009, Crockett created the annual Crockett Foundation Community Health Festival for the residents of Broward County. Through this initiative, the Crockett Foundation brings the community together as families prepare for the back-to-school season. The goal of the festival is to educate families on the importance of maintaining good health and to promote positive lifestyle choices. In the community, Crockett is a member of the non-profit Executive Alliance of Broward and the Orange Bowl Committee, and serves as chair of the Orange Bowl Youth Football Alliance. Crockett also serves as the Orange Bowl Liaison for the NCAA Sun Belt Conference. He recently was accepted into Leadership Florida Class XXXV where he will participate in an eight-month educational program that consists of a series of sessions held in cities throughout Florida. In 2015, Crockett was honored at the Greater Pompano Beach Chamber of Commerce Annual Shining Star Awards Luncheon for he Crockett Foundation’s impact on our community. In October of this year, he will be inducted into the Broward County Sports Hall of Fame for positively affecting Broward County through sports and athletic involvement. Also a successful businessman and entrepreneur, Crockett is the president and CEO of South Florida Development & Investment Company, president and CEO of Guaranteed Enterprise Trucking Services and owner and operator of Vanity Salon. He obtained his Bachelor of Science degree in criminology from Florida State University and is an active alumni member of the Omega Psi Phi Fraternity.